The DoppSite DF program is an IBM/PC Windows program that accepts an RS232 PicoDopp DF input and generates a public ( internet ) website, to provide the DF information to one or more remote GoogleEarth displays. It is suitable for use with a "base station" ( stationary ) Doppler DF site. The GoogleEarth displays can be configured to "refresh" as often as once per second, allowing realtime updates of DF information. Multiple DoppSite stations can be plotted on a single display, yielding realtime DF networks. The ( free ) DEMO version of DoppSite is available on this website for immediate download, to allow user evaluation / testing. The DF bearing line ( painted on the display ) is limited to 1 mile length and the bearings are not time-stamped, but otherwise the DEMO version is fully functional, and can be used to create ( range limited ) DF networks. A TEST mode allows "simulation" of DF bearings without a PicoDopp DF or FM reciever. The DEMO version allows user-adjustment of DF station latitude and longitude. The STANDARD version of DoppSite is available ONLY on request, ( see e-mail link at bottom of this page ) and the user must identify the DF station latitude / longitude, which is then "hard-coded" into a customized STANDARD version, for the user's DF station. The STANDARD version is available FREE to those who purchase a PicoDopp DF, and for US$ 99 to others. The length of the DF bearing line in the STANDARD version is typically 20 miles, but other lengths can be requested. Both versions ( STANDARD and DEMO ) allow user selection of the RS232 COM port that is used for PicoDopp DF input. ( COM1 to COM8 ) Computers with USB ports ( but no COM ports ) can be adapted to work, with economical RS232 / USB adapters. For both versions, the user can also specify the internet PORT for the resulting website, ( 0 - 65536 ) and DF CALIB controls are provided to allow ( user ) "adjustment" of the reported DF bearing. In order to use the full ( remote viewing ) potential of the DoppSite program, the internet address ( IP address ) and port number ( IP port ) of the DoppSite computer must be identified and provided to the GoogleEarth display, so GoogleEarth "knows where to go" to get the DF information. The PORT number is user - selectable, but the IP address is not... guidelines and information about how to identify the IP address ( and "stabilize" it, if required ) is provided in the DoppSite Notes document. The GoogleEarth viewer program is a ( free / public ) product of Google Corporation of Palo Alto, California, USA. The DoppSite DF Website program ( DEMO version ) is a ( free / public ) product of Doppler DF Instruments, Santa Barbara California, USA. There is NO ASSOCIATION OR COLLABORATION between Google Corporation and Doppler DF Instruments, regarding these two programs. Please direct ANY and ALL questions / comments to Doppler DF Instruments, NOT to Google Corporation. DoppSite was created by Bob Simmons ( WB6EYV ) using VisualBasic 6 on a PC running a Windows 7 operating system, in December 2010. The GoogleEarth viewer program has a feature called NETWORK LINK ( found in the ADD menu ) that allows an external KML file to be accessed and loaded into GoogleEarth, for display. KML files are special text files ( similar to HTML files ) that allow various "display features" to be added to a GoogleEarth display, and these NETWORK LINKs allow the DoppSite program to ( remotely ) display the DF bearing information. GoogleEarth NETWORK LINKs can be used to display a KML file located on the same computer as the GoogleEarth display, but they can also fetch a KML file from a website, using the internet. NETWORK LINKs can also be set to "refresh" at regular time intervals, as often as once per second, so that the displayed data is always "fresh". NETWORK LINKs are usually created "by hand" in GoogleEarth, and the details of this process are described in the DoppSite Notes document. 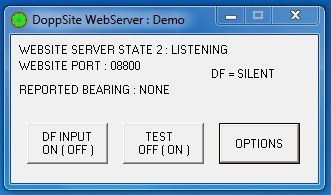 The DoppSite webserver program is intended for fully automatic operation ( no human supervision ) at a base station DF site, so the control panel is very modest, and limited to controls that are useful mostly for installation, testing and maintenance. Clicking the OPTIONS button reveals a second control panel with additional controls that normally require adjustment only once, when the program is originally installed. That panel is described ( separately ) in the section following this one. Aside from STATE 2, ( LISTENING ) this display might briefly "blink" any of the other states. The actual HTTP transactions ( requests from the GoogleHunt displays ) will take only a few milliseconds of time for each display, so the WebServer routine spends the large majority of its time "listening" for service requests from the displays. The REPORTED BEARING caption shows the DF bearing that is currently being reported to the GoogleEarth displays. This number ( 000 to 359 degrees true ) can be adjusted with some controls on the OPTIONS panel, to get best accuracy, in case the DF antenna was installed with some minor alignment errors, so that it does not properly "point north". Adjusting the reported DF bearing on the OPTIONS panel is easier than ( possibly ) climbing a tower to rotate the DF antenna manually. If no signal is present on the channel, the PicoDopp DF will not generate any DF messages, and this caption will read REPORTED BEARING : NONE. In this case, the DoppSite program will "paint" the station icon on the GoogleEarth display, but no DF bearing line will be painted. If the TEST mode is selected, this caption will show the DF bearing currently being reported by the simulation routine. The image below shows the OPTIONS page. This page is normally hidden from view, but is revealed by clicking the OPTIONS button on the DoppSite main panel. This panel is used to set values for quantites that normally don't ever change, once a specific DF site is commissioned. The STANDARD version of the DoppSite program paints a DF bearing line 20 miles long, ( other lengths available on request ) but these station lat/long controls are DEFEATED. The STANDARD version is only available by e-mail request, ( see e-mail link at bottom of this page ) and the user must specify the DF station lat/long when requesting it. The specified lat/long is then "hard coded" into a custom version of the program, so that the station lat/long CANNOT be changed. This is done to defeat software "piracy", because any ( unauthorized ) copies of the STANDARD DoppSite program will "paint" the DF station at the exact same lat/long location, making the copies ( essentially ) useless. The DF CALIB frame allows the user to add a correction factor to the PicoDopp DF bearing before it is reported to the GoogleEarth displays. This allows the user to compensate for any misalignment of the DF antenna that might accidentally occur when it is installed at the DF site. ( a trimpot adjustment on the PicoDopp MAIN PC board also offers this feature ) Note that the controls allow only positive values for the correction factor, but negative correction values can be accomplished by adding the "360 complement" of the desired number. For example, if the PicoDopp reports a bearing of 245 degrees when the signal is actually coming from 228 degrees, the correction factor should be ( 228 - 245 = ) -17 degrees. To achieve this, make the corection factor = 343 degrees. ( = 360 - 17 ) Adding 343 to 245 yields 588 degrees, but the software will automatically subtract 360 degrees from the result because value greater than 359 are not allowed. As a result, the reported value will be 588 - 360 = 228 degrees. The DF COM PORT frame allows the user to select one of 8 COM ports for the PicoDopp DF RS232 input to the DoppSite program. Sequential clicks on this button will select different COM ports, ( COM1 through COM8 ) and each new selection will be immediately "tested" ( by the software ) to see if it is truly available for use on that computer. If any errors are detected during this test, the background color of the button will switch to dark grey, to indicate the COM port cannot be used. If no errors are detected, the background color of the button will be light grey, like the other buttons on this panel. The WEBSITE PORT frame allows the user to select the internet PORT number for use by the DoppSite "webserver" routines. This port number can range from 0 to 65535, but values below 1024 and above 49151 should be avoided since they are pre-defined by the internet community. Depending on local circumstances, some ports between 1024 and 49151 might be unavailable on the DoppSite computer, if other programs on that computer are concurrently running which employ a network connection. Changing the PORT value will trigger an immediate test of the new PORT, to verify it is truly available for use. ( similar to the COM PORT test ) If the selected PORT fails ( for any reason ) to open properly and immediately, a message box will appear warning that a PORT CONFLICT has occurred, and the selected port will be switched to 65535, automatically. The EXIT button will hide the OPTIONS panel. Details about the installation and use of the DoppSite program are provided here : DoppSite Notes It describes the installation and use of the DoppSite program, but also provides a general set of guidelines for the entire process of creating a Doppler base station DF that uses the DoppSite program. Creating a Doppler DF site is not a trivial task, but probably is not as difficult as making a VHF or UHF repeater. Depending on the resources already available to the builder, it can be done for a cost ( possibly ) as little as the cost of a PicoDopp DF. Building and commissioning a Doppler website will yield a realtime, wide-area "hunting utility" for the benefit of the local public ( or private ) DF community... one that an average technical person can use, requiring only a GoogleEarth display. A single DoppSite can quickly "narrow down" the search area considerably, and multiple DoppSites with overlapping coverage areas will yield a VERY POWERFUL realtime DF "network"... one that is available 24/7/365 to anyone with internet access... a network that can reveal the general location of a jammer in seconds. There are a few potential DoppSite problems the reader should know about. They may or may not apply in a particular installation, but they are mentioned here in the spirit of full disclosure. Regarding the program installation, the user must deal with any problems involving firewall programs that might interfere with operation of a DoppSite program... interrogations coming into your DoppSite computer from unknown internet sources ( i.e from the GoogleEarth displays ) will almost certainly raise suspicion in a firewall program. Possibly also some interference can occur from anti-virus programs, and ( again ) the reader must deal with these issues, ( if they occur ) and sort them out. 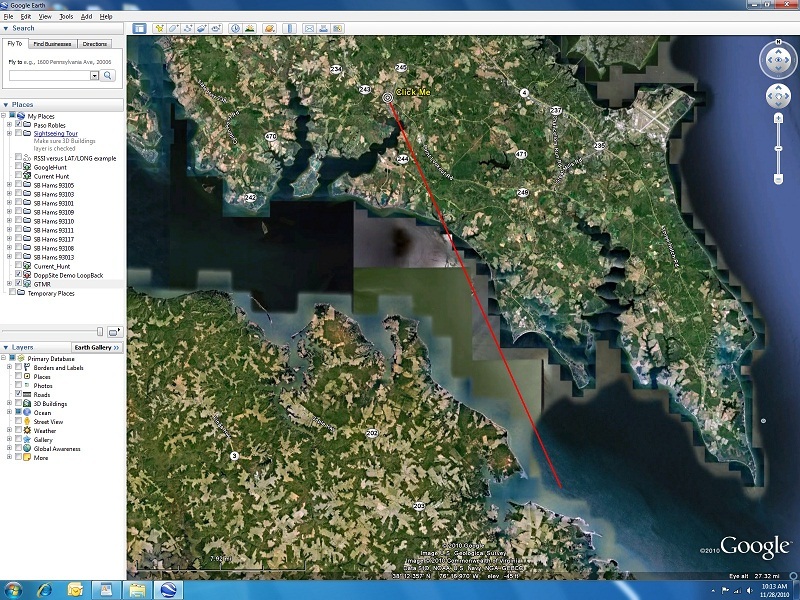 If the computer is connected directly to the internet, then access from remote GoogleEarth displays should be easy to accomplish. If however the computer is part of a LAN, and/or connects to the internet through a router or switcher, then more work generally will be required to deal with firewalls in those routers/switchers, and some knowledge of network technology will be required. ( get the help of a friend, if you must ) However it is done, a "direct path" to the internet must be created for the DoppSite computer, so that it has its own unique IP address, which will allow the GoogleEarth displays to talk directly to it. Once the foregoing issues have been sorted out, the computer's IP address can be identified and used to initially test the DoppSite program from a remote location, but virtually all home computers have "dynamic" ( = temporary ) IP addresses, which can change at any time. Eventually, it would be wise ( or necessary ) to "stabilize" the IP address, so that it never changes... this will allow the GoogleEarth displays to "find" the computer, reliably. This can be done a couple of different ways... one way is to get a "static" ( = constant ) IP address from the company that provides your internet service. This will cost a little extra each month. Another way to do this is to use a "domain name maintenance service" like no-ip.com. There are several such services, available ( free ) as a promotional tool, to attract business for other related services. Using a service like this, you select a "domain name" for the DoppSite computer, and install a program on it that runs in the background. The program constantly watches the IP address of the DoppSite computer, and if it ever changes, it reports the new address to DNS computers running at ( for example ) no-ip.com. The DNS computers ( DNS = Domain Name Servers ) then associate the new IP address with the domain name you selected, so any public inquiries for that domain name will ( automatically ) be re-directed to your DoppSite computer. Finally, regarding the GoogleEarth display program itself, it has been observed that the network links will sometimes "fault" for no apparent cause, and the automatic display updates will stop. Experiments have determined this is due to a deficiency in the GoogleEarth viewer program, which sends out one, and ONLY one "service request" message to the DoppSite program whenever a "refresh event" occurs. If the ( service request ) message is somehow "lost" while traveling through the internet, ( or the reply message is lost while coming back ) then GoogleEarth will NOT "try again" to make contact with the DoppSite computer... instead, GoogleEarth will eventually "give up" and shut down the link. ( other links will remain active ) When this occurs, the link must be MANUALLY opened again, by right-clicking the link in the PLACES list, and selecting REFRESH from the pop-up list that appears. Exerience has shown the fault rate can range from tens of seconds to many hours to days... it all depends ( more or less ) on how much traffic is on the internet pathways between the GoogleEarth computer and the DoppSite computer, and apparently also how far the packets must travel... local links ( 100 miles or less ) seem more reliable than long distance links. Another GoogleEarth problem has been observed with the newest ( beta ) version : version 6. ( January 2011 ) Clicking the station icon, and then clicking the website link in the pop-up window that appears, will cause a fatal error that shuts down the GoogleEarth program. This problem is not evident in the earlier version of GoogleEarth, ( version 5.2 ) which is still available for download / install. To get the 5.2 version from the GooglerEarth download page, the two option check boxes for the GoogleChrome browser must be unchecked, and then click the ADVANCED SETUP link and check the 5.2 version before starting the download.